The men’s soccer team began the Heartland Conference program with a 3-1 victory over the Roger State Hillcats in front of a crowd of 503 at Stang Park Sept. 13. 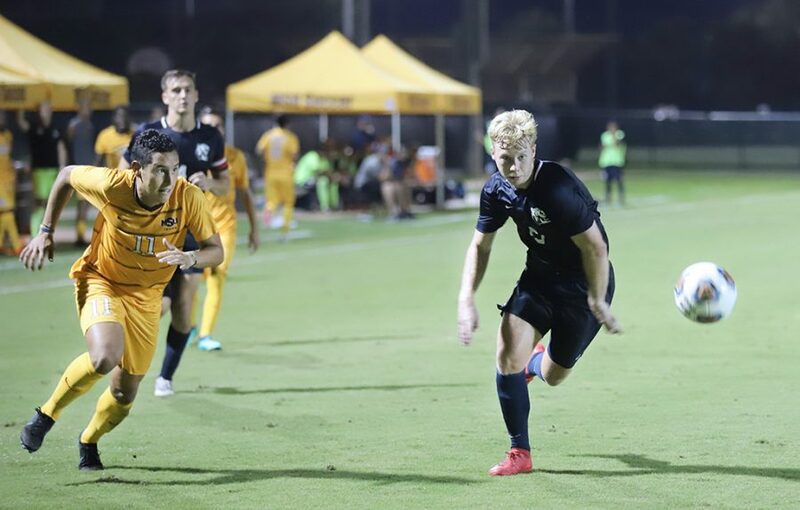 The Mustangs got off to a rousing start with forward Sergio Lara, scoring a close range from eight yards thanks to an assist from midfielder Ross Fitzpatrick. The Mustangs were on the offensive end as MSU completed 12 shots to Roger State’s 4 during the first half. The Mustangs were allowed three corners during the first half, but could not convert on corners. 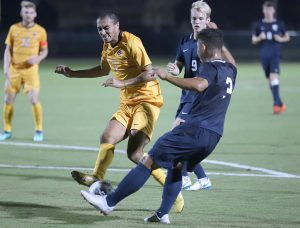 The Mustangs were the possession-based team, creating opportunities in the final third as Rogers State created the bulk of their opportunities on the counter-attacks. As half-time approached, the Mustangs conceded a goal in the 39th minute from Hillcats’ Abe Young on a breakaway from 10 yards. Michael Meachum, men’s head soccer coach, said he insists on keeping a composed mentality with the team during the halftime discussion. “I wanted the discussion to be more about us as opposed to them [Rogers State]. We conceded a goal in a bad time, six minutes before half-time. But we felt confident on what they [Rogers State] were trying to do tactically and with the personnel we had, we made the necessary adjustments,” said Meechum. The Mustangs stuck to the philosophy of controlling the game with possession and being on the forefront. At the 58-minute mark, the Mustangs pulled one away as forward Juan Ramirez scored a header from midfielder Carlos Flores cross that traveled from 17 yards. Rather than being defensive, the Mustangs took no chances to pursue the the third goal. The Mustangs got their third goal in the 83 minute mark from midfielder Julian Barajas as he broke away to score a goal from 15 yards from the right post. Koby Sapon-Amoah said he was happy with how fluid, progressive the team was. Koby also indicates that soccer is more of an instinctive sport. “What makes soccer one of the best sports in the world is that there is no set play in other sports. It is different to football and basketball where they’re more oriented towards X’s and O’s. Soccer is all about the instincts and making sound decisions,” Koby Sapon-Amoah, defender and kinesiology junior, said. The men are engaging in a program-record 27 matches of being undefeated. This is the first Heartland Conference victory under Meachum’s tenure as head coach. CORRECTION: In an earlier version of this story we misspelled the coach’s name. The Witchitan apologizes for the error.